(CNN) -- Described as the largest single gathering of displaced residents in the world today, tens of thousands of civilians are seeking shelter along the Afgooye corridor outside Mogadishu, according to the United Nations. 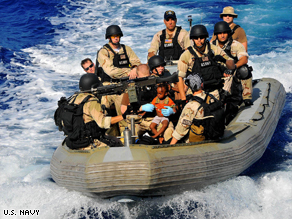 Members of the U.S. Navy take a young Somali boy to safety after rescuing him and 51 others adrift in a skiff. Fighting between government forces and Islamist militias has triggered the flight of more than 67,000 Somalis in and around Mogadishu since May 8, the U.N. refugee agency said Tuesday. Most of them are heading to the Afgooye corridor, a 30-kilometer (19-mile) stretch of ramshackle housing described by the United Nations' World Food Program as "a nightmare." The corridor between Mogadishu and the town of Afgooye is already home to 400,000 displaced Somalis, some of them living in huts made of twigs and branches. The clinics are already overwhelmed with malnourished and sick children. This week, Somalia's transitional president, Sheikh Sharif Sheikh Ahmed, asked the international community "to help Somalia defend against foreign militants who have invaded the country." Ahmed told local journalists Monday that he feared these foreign fighters would turn Somalia into another Iraq or Afghanistan, where U.S.-led forces are fighting Islamic extremist groups. The fighting has cut supplies of "desperately needed humanitarian aid" to the displaced Somalis near the capital city, according to the Office of the U.N. High Commissioner for Refugees. "We are starting today the distribution of aid for some 50,000 people in Afgooye corridor through our local partners in Somalia," the refugee office said Tuesday. "Today's distribution will include cooking sets, plastic sheeting, blankets and mats." The number of Somali refugees fleeing to nearby countries also continues to rise, with some 500,000 already in Kenya, Ethiopia, Uganda, Djibouti, Eritrea and Tanzania. Many Somalis have also made the dangerous journey across the Gulf of Aden to Yemen. A helicopter based on the USS Lake Champlain happened to spot the stranded mariners, according to the vessel's commanding officer. "It's fortunate that our helicopter was flying over the right place at the right time," Capt. Kevin P. Campbell said in a U.S. Navy news release. "I'm glad we were able to be of assistance and rescue these men, women and children. Our chief hospital corpsman stated that had we not found them at the time we did, the pregnant woman may not have survived." USS Lake Champlain has been deployed as part of the U.S. 5th Fleet's mission to patrol the Gulf of Aden region, which has been plagued by pirate attacks off Somalia's coast. "We were very fortunate to have come across these people in the state they were in," said the ship's chaplain, Lt. j.g. Jarrod Johnson. "Seeing their condition really makes your heart go out to them. You can see the relief and hope in their eyes, and hear it in their conversation."